The book launch for the anthology Regeneration was on Friday July 12. The cover art is amazing and it contains a smorgasbord of stories by many talented New Zealand writers of speculative fiction as well as a story by myself entitled The Spectre Spectrum. The launch was great fun with Dan Rabarts reading an extract from his excellent story Mother's Milk and many books were signed. 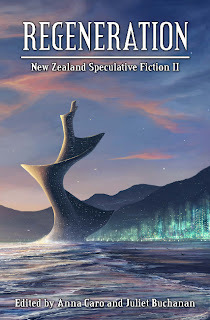 Regeneration is available from Random Static for $NZ 9.95 for the eBook or $24.95 for the Paperback (with a free eBook).